The monument erected at original burial site of Mary MacKillop commemorates her beatification as Saint Mary of the Cross MacKillop. 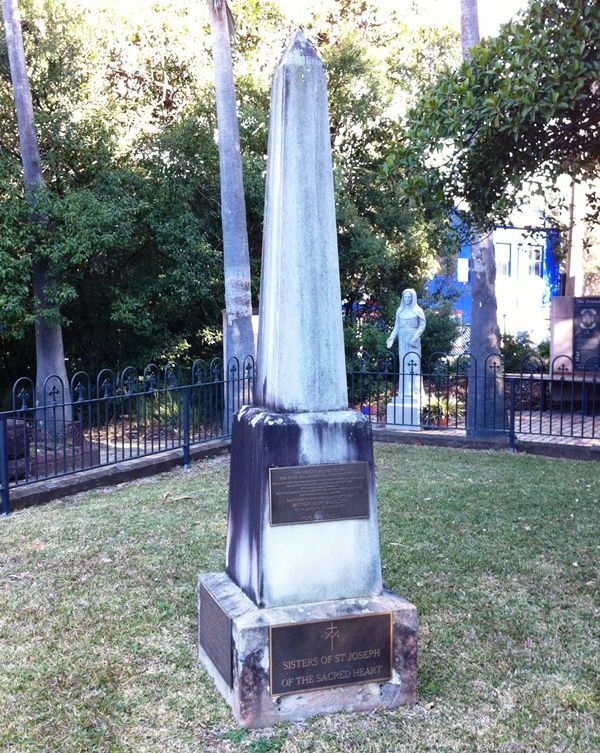 The monument was funded by Government grants and commercial and private donations. The monument contains the plaque which was unveiled in 1987. 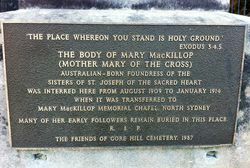 On her death on 8 August 1909 Mary MacKillop was originally buried at Gore Hill cemetery, surrounded by previously departed Josephite nuns. Unfortunately, Mary's grave began to suffer from the love and excess devotion of the faithful, and concerns were raised when soil began to disappear from the gravesite. In 1914 it was decided to remove her remains to the present resting place at the Mary MacKillop Memorial Chapel, Mount Street, North Sydney. Mary Helen MacKillop (15 January 1842 – 8 August 1909) was an Australian Roman Catholic nun who, together with Father Julian Tenison Woods, founded the Sisters of St Joseph of the Sacred Heart. Since her death she has attracted much veneration in Australia and internationally. MacKillop is the only Australian to have been beatified (in 1995 by Pope John Paul II). On 17 July 2008, Pope Benedict XVI prayed at her tomb during his visit to Sydney for World Youth Day 2008. On 19 December 2009, Pope Benedict XVI approved the Church's recognition of a second miracle attributed to her intercession. Her canonisation was formally declared on 17 October 2010, making her the first Australian saint. She is now known as Saint Mary of the Cross.